This is a meditation on Vincenzo Natali's new film Splice. For a more succinct evaluation, read my review at BlogCritics. Parenthood is complicated. Any parent of a teenager will tell you that. But for Elsa and Clive, the characters in Vincenzo Natali’s Splice, this complexity is intensified to dangerous levels, as they become the surrogate parents for a hybrid semi-human creature of their own ill-advised creation. As this creature, Dren, develops, the three form a clandestine family hiding out in back rooms and abandoned barns, and their struggles bring into relief the other parental relationships in whose orbits they fall. The life cycle is a common theme in horror, developed in countless films that include pregnancy, birth, and childhood, all of which provide some flesh for the genre’s claws. Rosemary’s Baby, Dawn of the Dead, The Fly, The Brood, Inside (À l'intérieur), Orphan, The Exorcist, Children of the Corn, Pet Semetary, The Others, The Innocents, and dozens of others have appeared to reinforce the “creepy child” cliché and haunt us with veiled faces of young faces with dead eyes. Perhaps this is because pregnancy and birth are bridges to another world, or that they’ve got such deeply-rooted psychological implications for us; perhaps it’s actually rather easy to see children as “other,” since their minds are so opaque to us conditioned adults. There’s something unsettling about the way we’re so accustomed to casting children as ghosts, monsters, and abominations. Surely it’s worth the shock value, but it also seems exploitative at times (one of the essential threads through horror, I guess). 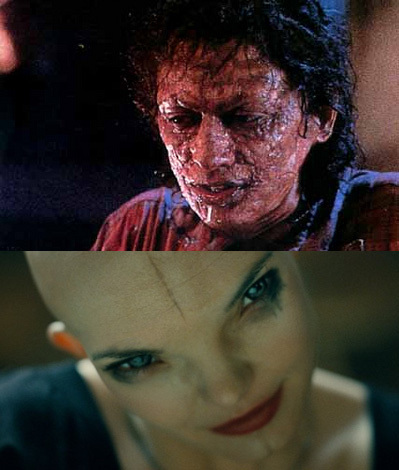 Splice is a refreshing exception to that tendency: Dren is certainly strange to us, an unidentifiable creature developing into an experimental analog to a human teenager, but she’s more recognizable than incomprehensible, and Natali focuses more on her humanity than on her monstrosity. She comes alive as a character in intoxicating sequences of self-actualization: when she strokes a Barbie doll, when she puts on makeup in the mirror, and when she dances with Clive, her Cassandratic fixation. That’s why Splice, despite its insistence on being about physical biology, is much more a film about the complexities and responsibilities of parenting, which is the source of the real narrative drive and the palpable suspense that builds in Elsa and Clive’s lives. This theme is introduced early, in Elsa and Clive’s discussion about having children, and it infuses their relationship from that point forward, as they struggle against one another to decide whether they’ve created a “she” or an “it” (a conversation that becomes much more complicated toward the end of the film). Both Clive and Elsa seem to oscillate back and forth between these two positions, which provide the emotional riverbed for the downhill rush of narrative. This theme is comfortably transparent, addressed as it is in a number of expository dialogues between Clive and Elsa. Most telling is their argument, late in the film, where Clive exposes Elsa’s willingness to use Dren as a surrogate child without the attendant stakes and responsibilities. The relationship between this conversation and Elsa’s murky family history is suggested; Clive obviously thinks that Elsa’s hesitation stems from her own mistreatment by her mother. Whether he thinks she’s reacting against this phantom matriarch, or subconsciously imitating her, is left an open question. What’s far more important – and more interesting – is Clive’s assertion that Elsa is “afraid of losing control,” which is probably the most apt description of Splice’s actual narrative trajectory. After all, the tension in Splice, for at least the first two-third of the movie, isn’t due to the stalking of a dangerous monster, as it was in Species and Alien. The suspense stems from Clive and Elsa’s knowledge that they committed their scientific sin in the face of every warning and injunction, and that they’ve taken on an impossible task: the task of protecting a living creature from discovery and harm, and of protecting themselves from institutional punishment. Of course, this dovetails with the theme of paternity… Clive and Elsa’s lives would get MUCH easier if they killed Dren (as Clive attempts in an early scene) and destroyed the body, but they can’t, because they’ve taken on the role of parents to the growing creature. Thus, before our eyes, they inevitably drift into their dilemma, and as early as Clive’s evasive conversations with his brother, we can see disaster looming on the horizon. Gross-outs aside, this impossible escalation is where Splice most resembles The Fly, with which it is often associated. Cronenberg's sick tragedy, the chronicle of a man's slow and inexorable transformation into a repulsive monster, is a reverse template for Splice, in which the creature evolves from a half-formed fleshy thing into a blossoming specimen of (modified) human form. Like Splice's Clive and Elsa, there is a human observer named Veronica (Geena Davis) in The Fly... and like Clive and Elsa, Veronica has to decide how personally to take this tragedy, and whether to invest emotionally in an insoluable situation, or find a way to renounce it. Again, though it's not spelled out, the specter of parenthood is present. In The Fly, there's a double-layer of paternal issues: Veronica's caretaker role with poor Seth Brundle, and her actual pregnancy, which threatens to result in a possible freak-baby from her mutating love interest. And as Seth informs her, these two concerns interlock... as Brundlefly starts to realize his own dire situation, he points out to her that the baby might be all that's left of his humanity. Veronica has to content with compounded responsibilities and anxieties... her love for an unborn child of uncertain origin is bound up with her compassion for a hopeless case. This subtext -- Veronica's responsibility toward Seth via the unborn baby -- is the only hint in The Fly of a parenting theme that becomes foregrounded in Splice: the perverse tendency of parents to turn children into objects, whether it's a doll (Shutter Island), an experiment (Dren), or a tribute to a lost love (Seth's baby). Elsa offers us a clear picture of a binary neurosis at its finest, shifting between extremes of unconditional motherly love and mechanical, scientific coldness towards Dren. Dren's alarming defiance triggers Elsa's "detached, scientific" self, which is essentially her excuse to be cruel to Dren under the auspices of scientific objectivity. As Elsa shuts off her short-circuiting maternal instinct, she suddenly decides to treat Dren as an object, rather than as a family member. This mode-change is almost as jarring as Aaron's transition into Roy in Primal Fear. I mentioned a two-tier structure of parenthood themes in The Fly... turns out there are more layers to the paternal metaphor in Splice, as well. In particular, Clive and Elsa's parent relationship to Dren, where they stand on the line between treating her as an experiment and treating her as a family member, is echoed in the investors' treatment of Clive and Elsa themselves. Like Dren, looking for understanding and validation from her surrogate parents, Clive and Elsa are constantly engaged in a relationship of subservience and subversion with respect to NERD's high-level financiers, represented by Joan. Before all the hubbub about Dren's loyalty and family ties, there is an original betrayal that sets the central tragedy in motion, and this is the investors' decision to cut Elsa and Clive off of their important research and force them to work toward a financial bottom line. Their decision to stop their unconditional support of the research, and to turn Clive and Elsa's lab into a tool for profit, is a prelude to Elsa's eventual treatment of her "experiment." So how does Clive's behavior fit into this? He has to be convinced to treat Dren as a living thing, rather than a dangerous and unfortunate curiosity. However, his relationship with Dren eventually evolves into something totally unlike a parent, even a reluctant one. His sudden sexual interest in Dren could be seen as yet another form of objectification, but it actually reads more like a final bit of humanization after Elsa's mistreatment. Clive is willing to treat her as a viable sexual partner, to gratify her desire and indulge his own, and this validates one of Dren's few expressions of her own agency with regards to her "parents." However, this conduct reveals a dangerous force within Dren. In the midst of this very vulnerable, very human moment of ecstacy, Dren almost does something very animalistic indeed, if I'm interpreting it right. She raises her stinger above Clive; I have to presume that she intends to kill him after mating with him, and that she's only prevented by the arrival of Elsa. This is where the line between human and animal suddenly blur in Dren, and it seems to blur in Clive, as well; the disruption resulting from this development is the final destabalizing factor that will blur the line between parent and lover, human and animal, and a whole host of Freudian complexes, and it will bring the fragile family crashing to the ground. Like all good explorations, Splice doesn't have a message it wants to communicate, unless you get hung up on that whole "don't play God" thing. In truth, these characters are playing God in the same way as the majority of humans, who create children in their image, who learn to guide those children into adulthood, and who have to negotiate a complicated space between respecting the personhood of those progeny and treating them as means to an end. What Splice does well is to illustrate the true complexity of that space, and to evoke the real anxiety and uncertainty that comes with parenthood: the high stakes that come with investing your own emotional well-being in somebody else, and the fear of losing control, inherent in the knowledge that you simply don't know how this child is going to turn out. This is the truth of fear: in every great decision and commitment, there must be a cold core of helpless terror in knowing that we surrender a little bit more control over our own lives. The only thing separating us from Clive and Elsa may be hope and circumstance. I think you were right to point out how Elsa is driven by her need to be in control of the situation. I am unconvinced about your argument that the financiers play a parental role to Elsa and Clive. I can see how one might interpret Elsa and Clive behaviors as either seeking approval or rebelling from Joan, but I thought it seemed as if Elsa and Clive behaved in spite of the financiers, not in response to them. For Elsa and Clive, the financiers and the money seemed hardly what they were really after. In my opinion, it seemed that Elsa and Clive were driven solely by ego. They brag about being on the cover of Wired magazine (note: they seemed more excited about being on the cover of a popular magazine than being able to publish their findings; at one point they even mention that they don't care if they get published or not) and Elsa anticipates joyously for the world to see their creation. They did not seem to care about finding the protein that the financiers were really looking for; they had their own agendas that existed separately from the pure financial benefits and support of the company Joan represented. Yes, Elsa did indeed need control, but she also could have been driven solely by ego. I think that the ending, in which we find Elsa pregnant with male-Dren's offspring, shows how opportunistic Elsa remains, despite the horror she had experienced. Ego is a powerful and adrenaline-powered emotion that can force someone to ignore ethics and morals in pursuit of glory. I thought there seemed to be a subtext of Elsa being interested in birthing the half-human/half-Dren creature not for the financial benefits Joan offered, but for chance to control the future situation. Having or gaining control, after all, can be a form of winning. Well, these motivations are hard to untangle, so I agree with your points, but don't think they fully disqualify my own... I think ego-validation, control, and frustrated maternal instinct (something Freudian, maybe?) were Elsa's most direct motivations. So I'm 100% with you on the ego and control things. However, the fact that Clive and Elsa acted again / in spite of Joan's demands doesn't disqualify the observation that the company was taking on a parental role. After all, one of Dren's most human moments, when she acted the most like a troubled teenager, was when she kept the cat as her own secret pet, and then in a moment of defiance, she killed it. Elsa and Clive's relationship with the funders, which is both indulgent and subversive, is a lot like the behavior of a teenager toward a parent, who holds a de facto position of authority... the child is always looking for both validation (i.e. the board meeting) and for a way to assert their independence (i.e. by defiantly creating the hybrid creature). I am doing some research and came across your article. It great having articles like yours out there for the public to view.